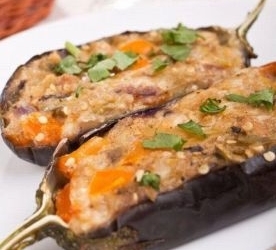 Vinete cu Carne | Meat Stuffed Eggplant is a Romanian food recipe also with onions, garlic and tomatoes. Wash 2 to 4 eggplants, cut lengthwise in halves, scoop out the seeds with some of the pulp and chop. Salt the halves, place on a towel and keep there until the juice is absorbed. Chop finely 2 medium-sized onions, one clove of garlic, a sprig of green leek and enough parsley to make a tablespoonful when chopped, add a little thyme, and fry in olive oil for 3 minutes. Now add the chopped pulp, one or two slices of bread soaked in milk, and heat for 2 minutes more. Add ½ pound of chopped meat (pork and beef mixed) and cook for another one to two minutes. Fill the eggplants with this stuffing, place in a buttered or oiled baking dish, cover with sliced tomatoes, sprinkle with bread crumbs, dot with butter and bake in a moderate oven. Baste now and then. Bake until tender.